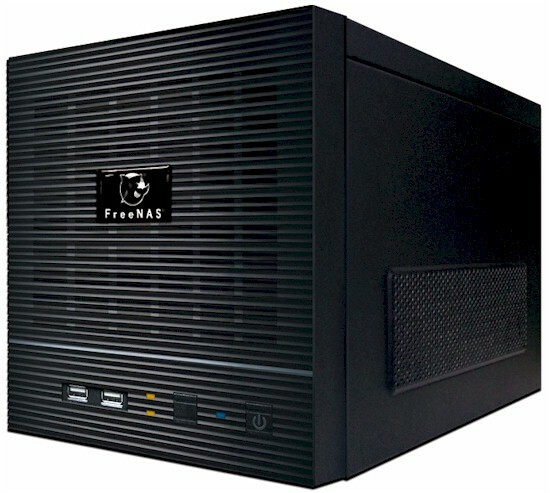 FreeNAS is open source NAS software based on the FreeBSD operating system. We covered FreeNAS in a review in 2007, plus I touched on using FreeNAS as a Virtual Machine in an article later in 2007. First, a little background. The FreeNAS project started in 2005, but stalled in 2009 when its original developer announced he could no longer support the development of FreeNAS. Another developer stepped in and there was the possibility of FreeNAS being ported to a Debian based operating system. Fortunately for BSD fans, development on the FreeNAS project based on BSD was taken over by iXsystems in 2010 and FreeNAS 8.0 was released in 2011. For the do-it-yourself bunch, FreeNAS is still available as a free download at freenas.org. iXsystems offers pre-built NAS systems for home and small businesses based on FreeNAS, which they call the FreeNAS Mini and FreeNAS Mini Plus. iXsystems also offers pre-built NAS systems based on FreeNAS targeted at enterprise under their TrueNAS product line. This review is for the iXsystems FreeNAS Mini Plus with FreeNAS 8.3.1. The Mini and Mini Plus are housed in a 8.0"W x 12.5 "D x 8.25 "H black steel mini-ITX PC case with a relatively quiet 200W power supply and 120 mm cooling fan. With the internal power supply, there is no external power brick. Inside the case is a chassis that houses four tool-less 3.5" disk drive bays. Drive bays are easily removed by popping a lever and sliding them out. Disks are attached to each drive bay with 3 screws. The front of the device has a power button, reset button, and two USB 2.0 ports. Opening the door on the front reveals the drive bays which have easy-sliding removable drive trays. The shots above and below show the front of the device and the front drive bays. The rear of the device has the I/O ports directly connected to the motherboard, shown below. There are six external USB ports, two are USB 3.0 and four are USB 2.0. The two USB 3.0 ports are below the 10/100/1000 Ethernet port. There is an eSATA port for connecting an external drive. Both the Mini and Mini Plus are (currently) built on an Intel DH67CF motherboard. The key difference between the two is the Mini Plus has a faster processor (Intel Core i5-3470T 2.90GHz on the Mini Plus vs. Intel Core i3 on the Mini) and more DDR3-1600 RAM (16GB vs. 8GB). In the below shot of the Mini's left side, you can see the motherboard and Intel CPU cooling fan. The overall construction is neat and simple. I like how the internal cabling is organized and tie wrapped. The CPU is cooled with the stock Intel heatsink/fan. The 120mm case exhaust fan is silent, but the power supply fan and Intel CPU fan are audible. Overall noise level is relatively low, but you're not going to want one of these on your desk, either. The hard drives in the FreeNAS mini seemed hot to the touch, but I didn't have any issues with heat. The FreeNAS operating system runs on an Apacer 4 GB USB flash drive. This 4 GB flash drive is a small chip connected directly to header pins on the motherboard. In the below shot of the Mini's right side, you can see an Apacer 4 GB USB flash drive just to the left of the SATA cables. Table 1 lists the key hardware components in the FreeNAS Mini Plus. If you'd prefer to build the hardware yourself, this article provides the parts details. Note that the motherboard used in the Mini Plus is a newer model.